We welcome all families to consider the gift of a Catholic education. Catholic schools provide a strong foundation for the Church’s greatest treasure, our young people. 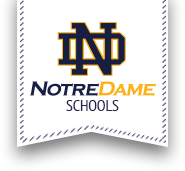 Families are encouraged to visit Notre Dame Jr/Sr High School Open House on Sunday, November 5th from 12:00pm-2:00pm. For more information, call the Admissions office at (315) 749-7060.